Professor Christopher Buddle was appointed as the Dean of Students on 1 August 2016, and brings experience in championing student rights and responsibilities, academic integrity, and promoting wellness for our entire community. Chris has been working at McGill since 2002 in the Department of Natural Resource Sciences at McGill’s Macdonald Campus. His research program is focused on the biodiversity and community ecology of insects and spiders, with an emphasis on Arctic systems. He has long been involved with academic programs and administration in the Faculty of Agricultural and Environmental Sciences, most recently teaching field biology and ecology in the Environmental Biology Program and holding the position of Associate Dean (Student Affairs). 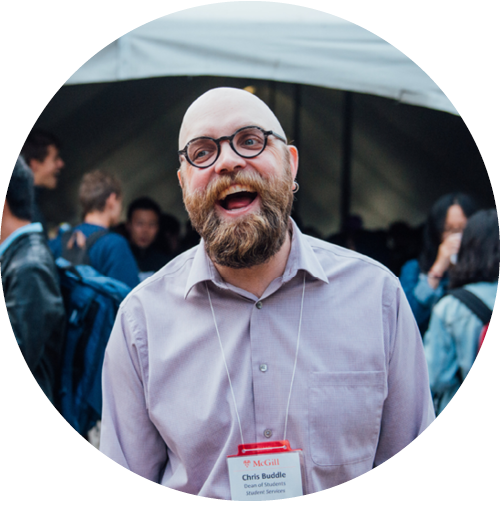 Chris is an award winning teacher, both at McGill and nationally: he was the recipient of the Macdonald Campus Award for Teaching Excellence in 2008, and the Desire2Learn Teaching Innovation Award (2014) from the Society for Teaching and Learning in Higher Education. He has also received recognition for his research by the Entomological Society of Canada as the recipient of the C. Gordon Hewitt Award for Excellence in Entomology in Canada (2006).